BeagleBone LCD7 Cape – Features a 7-inch TFT LCD screen with 4-wire resistive touch and five user buttons. BeagleBone Camera Cape – Allows you to add a camera via QuickLogic CSSP camera interface solution connected via the GPMC (General Purpose Memory Controller) bus of the Beaglebone. BeagleBone Weather Cape – Includes temperature, barometric pressure, humidity and ambient light sensors. BeagleBone DVI-D Cape – Provides a DVI-D interface, which can be handy since there is no video output on the beaglebone. 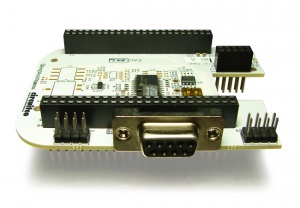 BeagleBone Breakout Cape – Provides access to the various BeagleBone components during troubleshooting. BeagleBone CANBus Cape – Makes use of DCAN1 interface of AM335x processor, enabling interfacing to automotive components and motor controllers. A total of 23 plug-in boards are available right now, and 2 are still in development (WiFi and Memory Expansion capes). The full list of capes is available on www.beaglebonecapes.com. For more information about capes, or if you want to design you own and register it, checkout www.beagleboard.org/capes.